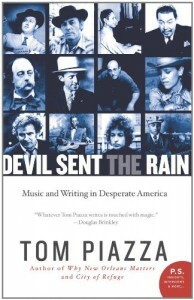 When I write to recommend a new book by Tom Piazza (“Devil Sent the Rain: Music and Writing in Desperate America” ), I have to say immediately that Tom is a friend of mine, although we have met in person only half a dozen times. Starting with a phone call he made to me a decade ago from Cape Cod, seeking recommendations for Sviatoslav Richter recordings, we have maintained a lively and wide-ranging contact through e-mails and phone conversations. In recent years our contact has diminished, mostly because Tom’s increasing success as a writer has left him with what one writer described as “a choice between writing novels and writing e-mails.” Still he is a best buddy and I have to admit that I hope you will be interested in his book because I want it to be a success. Reading through the essays in “Devil Sent the Rain: Music and Writing in Desperate America” , you will get a pretty good idea of the range of Tom’s interest, although it’s definitely not a complete survey. (Among other omissions, there’s nothing here about Gustav Mahler’s music or Sviatoslav Richter’s piano playing.) Although he studied writing at Williams College, he was also a serious pianist and for a time supported himself playing jazz piano. His “The Guide to Classic Recorded Jazz” although now outdated as a guide to current issues, is the best critical guide to jazz recordings I’ve ever read. (My late friend Marty Laforse, a historian whose jazz background went back as far as hearing Fats Waller play, borrowed a copy of the Guide from me and refused to return it; I had to buy another copy.) He has written a book of short stories and two novels in addition to various nonfiction, and there is another novel currently in the works. Tom moved to New Orleans fifteen years ago, after being attracted for years by the city’s music and general culture. He was en route home when the disaster we conveniently call Hurricane Katrina (although it was not the hurricane itself which caused most of the disaster) struck the city. Holed up in temporary quarters at his girlfriend’s parents’ home in Missouri, in response to a request from his publisher, he wrote the remarkable short book “Why New Orleans Matters” in five weeks. (Get the paperback edition, which has supplementary chapters.) This essay fulfills its title, and it’s indispensable for people seeking to understand the uniqueness of the city’s nature and its necessary place in America. He followed this up with the equally remarkable novel “City of Refuge,” a portrait of New Orleans after Katrina as seen through two very different families’ experiences. I still don’t understand why this book failed to become a best-seller and a blockbuster movie. “Devil Sent the Rain” is a collection of separate essays written for a wide variety of purposes and not originally intended to be published together. Issuing a book like this seem to indicate that Tom’s publisher believes he has a fan base large enough to justify a miscellaneous collection, which is gratifying to know. He has tied the material together with little introductions, much in the manner of Norman Mailer’s “Advertisements for Myself” . Since Tom was a close friend of Mailer’s for years, and includes two pieces about Mailer, it’s an obvious influence. The subtitle of the book is accurate. The first section is devoted to essays on a wide variety of musicians, including Jimmy Martin (a lengthy piece once issued as a separate book), Jelly Roll Morton, Bob Dylan (a longtime interest of Piazza’s), Jimmie Rodgers, Carl Perkins (how I envy him that meeting! ), Charley Patton, and others, including the Grammy-winning program notes to the Martin Scorsese “Blues” collection. Even when reading about musicians I was already well familiar with, like Perkins and Morton, I found new insights and illuminations in these essays. Others sent me back to my CD collection to rehear (and supplement) my understanding of the subjects. In fact, reading this book has already cost me a couple of hundred dollars in CD purchases, so beware. The last essay is one which may appeal mostly to collectors, particularly record collectors like myself. It’s about a surprisingly successful expedition which led to acquiring some very rare 78s. I suspect there’s some illuminating material about the nature of collecting in here also, but frankly, I can’t be sure, being afflicted with that syndrome myself. “Devil Sent the Rain” isn’t the most essential Piazza for newcomers to his writing. For the best introduction, go to “Why New Orleans Matters” and “City of Refuge.” But it’s a very entertaining collection, showing vividly the expressive and concentrated nature of his writing even while remaining spontaneous. I guess those qualities are just in his nature by now. They’re everywhere in “Why New Orleans Matters” despite the haste in which it was written.